The White Star Cruise Line possessed some of the most revolutionary ships of its time. Part of the same family, the Olympic, Titanic, and Britannic were some of the most luxurious ships of their time. The first Titanic sister ship to be built was the RMS Olympic. 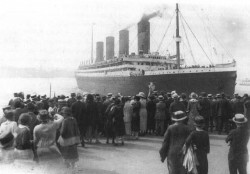 Built almost exactly a year before the Titanic, the Titanic sister ship Olympic was first launched on October 20, 1910. First of the White Star Liners assembled at the Harland Wolff shipyard in Belfast, the Olympic sailed her maiden voyage on June 14, 1911 to New York. When it comes to Titanic vs. Olympic, the designs are almost identical, with a few minor differences aside from the Titanic being considerably larger. 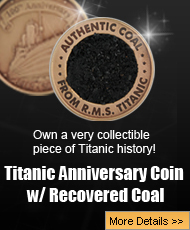 Both the Titanic and Olympic were designed as passenger cruise ships and used coal burning steam engine technology. They were some of the fastest cruise ships of the time and consequently both cost a hefty price to board. After the disaster, this Titanic sister was used by the British government for use as a troopship. Her most famous moment, and perhaps the most famous moment of all of the Titanic sisters is when the Olympic struck and sank a German submarine, U103. The eldest sister ship of the Titanic returned to commercial service after the war and gained the nickname “Old Reliable”. Soon after this, however, the sister ship of the Titanic collided with the Nantucket lightship and 7 people were killed. The last voyage of this Titanic sister took place on April 12, 1935 and she was demolished in 1937. Many of her pieces were auctioned off and can still be seen in various locations to this day. Some locations where Olympic pieces can be seen include the White Swan Hotel in Alnwick, England and the Southampton Maritime Museum.